Categories: A-D, Autumn, Featured Plants, Plants A-Z, Plants by Season, Plants In Situ, Spring, Summer, The Bog Garden and Bank, The Cottage Garden. This is a tall branching plant, each of its stems terminating in a group of richly coloured crimson flowers. The petals are closely packed and their even appearance gives the impression that the blooms have been trimmed across their tops to ensure a completely symmetrical appearance.In the early spring each plant makes a large basal rosette or, in older plants, a collection of rosettes, each with embryonic buds at their core. 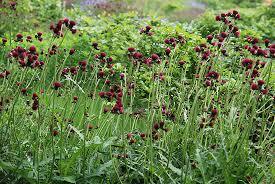 As the leaves begin to assume a thistly look the stems soar upwards, reaching 120cm (4ft) when grown in improved soil.Rivulare literally means “growing by a stream”, and this cirsium prefers damp and fertile ground. In farming folklore, thistles are associated with good ground and their presence is supposed to indicate high fertility. Some varieties are as exciting in seed as they are in full flower – but not this one. Its soft seed-heads look dishevelled, especially after heavy rain, and they tend to break up.Since it puts on its first show in early summer but still has a whole season of flower to offer, the best results are obtained by cutting back spent flower heads and their supporting stems when the flowers finish. This severe dead-heading promotes new flowers, and if they too are cut back, the flower season can be extended until the first frosts. When the last flowers fade, chop the whole stem down to the ground.Cirsium is a first-rate thistle with second-rate foliage that can often look tatty as the season progresses. When cutting down the last of the flower stems, it often pays to reduce the basal leaves, too. Using a pair of sharp shears makes the job quick and efficient, and fresh, new foliage will appear within a couple of weeks.